05:29-beep beep beep. Time for yoga. Oh why did I agree to this? The night have been a study in “to hot to sleep with the cover, too cold to sleep without”. I have woken countless times either sweating under the cover and gasping for air, or shivering without it. It’s almost morning and yesterday I thought it was as good idea to do yoga at 6:15 today. Go figure. We get over there and into the class. The lady giving the Hatha yoga class is good and the class is focused on stretching. We’re actually lowering the average age in the class by our present. There’s more grey hair in this class than in all my previous classes, I think. Back at the hotel we find that the breakfast it’s much better than anticipated. Big room, decent breakfast, let’s hope the air con can be tweaked a little tonight. First post of today’s program is the War Remnants Museum. It’s a museum focusing on the many years of war and trouble this country has seen. Given the fact that the French were here almost a hundred years before the War with the Americans should give you a hint. Most is focused on the last war, though. More than 17 years of fighting and with extreme incidents. This war saw the development of press photography go from the favored black and white pictures to color, before the video and finally directly broadcasted Tv by use of satellites. It’s, as it always is, presented by the view if the nation and the victorious. A lot if the pictures have claims of its content that can be read out of the scene. Or not. There where several pictures that claimed interrogation or torture that could easily been propaganda. Hard to tell. The one section that moved me the most was the Requiem. A tribute to the fallen press photographers during the war. Both sides of the Vietnamese press where represented as well as American, Japanese, French and a several others. Among them Robert Capa, one of the world’s most famous war photographers of all time. Known for his photos of the Civil War in Spain and who ended his life by a landmine in Vietnam. The pictures shown in this exhibition was his last reel still in his camera upon his death. There’s a part of the museum I skipped. I’m almost ashamed of admitting it, but it’s to heavy. The after math of Agent Orange depicts kids born with disfiguring, chronic diseases and more. We saw some of it but the room dedicated to this sad story was too much to carry. This museum is rated as the number one thing to see and do in HCMC. I agree. Even though it’s biased it’s informative and we should not forget. With a history like this it’s hard to fathom the Americans moving into Irak and Afghanistan. Go figure. On our way out we walked on the sidewalk focused on Google maps and we almost got Katja injured. We walked into an area where they cut down branches from as tree. A worker thro threw himself in front of Katja just as the branches started falling from above. We don’t need that kind of injury. Next stop, just a short walk away, is the Indonesian embassy. We’re to pick up the passports, but did we bring our receipt? 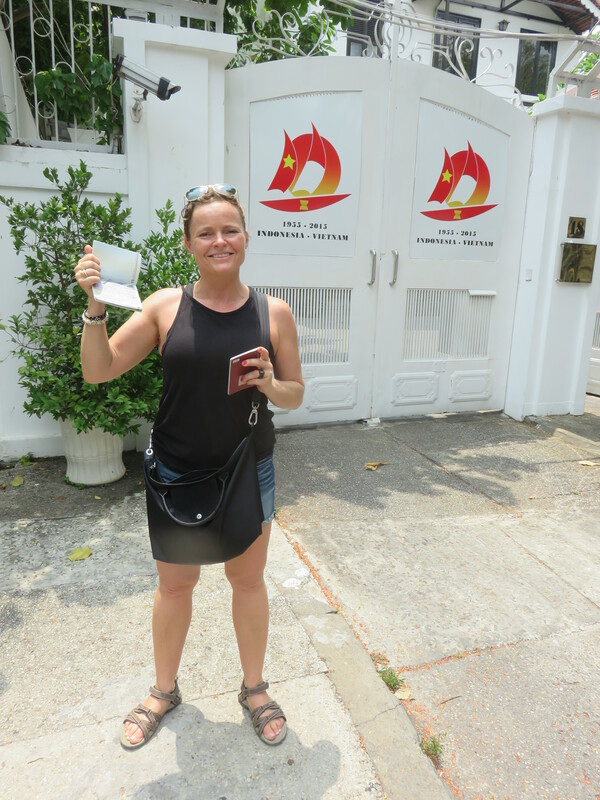 Just like with the Thai embassy in Hanoi we figure our nice smiles will get us what we want. At the counter the guy smiles and takes out our passports and ask for the receipt. When we tell him it’s back at the hotel he’s not all that happy, but hey we smile. Then there’s a question whether or not I have different pictures. Turns out they’re not overly happy with me being in a tank top either. We say, as true us, that no I have not. With strong recommendation to have a t-shirt on next time, and a promise to tear up the receipt, we get the passports. Wuhu! I bought myself three very nice tank tops in Bauan, in the Philippines back in November. Used daily and for training they now smell like something that’s not in my vocabulary. I need new ones. Let’s go shopping. Katja refuses of course, because she hates shopping…. Yeah right. We aim for Vincom shopping mall a short walk from the embassy. We’re getting ready for lunch and agree to stop if we find anything tempting. We do. A few corners from where we stayed we find a display of crispy pork. We’re sold. Turns out the place is super popular among the locals but no-one speaks English. With pointing and help from a couple of the other patrons we manage to get served a lot of food and drinks. It’s very good and when we pay it costs less than one glass of wine at our last stay. Further up the street we find a barber on the corner. He has put up a cover and on the concrete wall he’s put up a mirror. ” Number zero”, I say and point to my head. He just nods add asks me to sit. He don’t say a word during the process, but gets off what needs to be removed. Afterwards he writes the price on a newspaper. Sixty thousand Dong, the equivalent of 24 NOK or just under 3 euros. Did I say my haircuts are cheaper than Katja’s? The shopping mall is fancy and I get new tank tops. I even get a new power supply to the pc, as the one we have has connection issues from being wrapped up and packed in the bag. Back home I see that it fits perfectly for the fact that the power plug itself is wrong. Damn, have to carry the power cable around and hope to find a store that can provide the right one. From the shopping we go to the room and relax for a short hour before heading out to dinner. Katja found a Mexican restaurant rated as number four on Tripadvisor that’s located just around the corner. We’re the only guests when we get there and the proprietor, Scott, greets us and set us up. The food is delicious, so are the beer and the margaritas. Before we leave the place is crowded. Food is coming. Relax, dude! In the room we try to get in sync with the blog and put out a couple of posts. We’ve posted more than three hundred now. Damn, time flies. 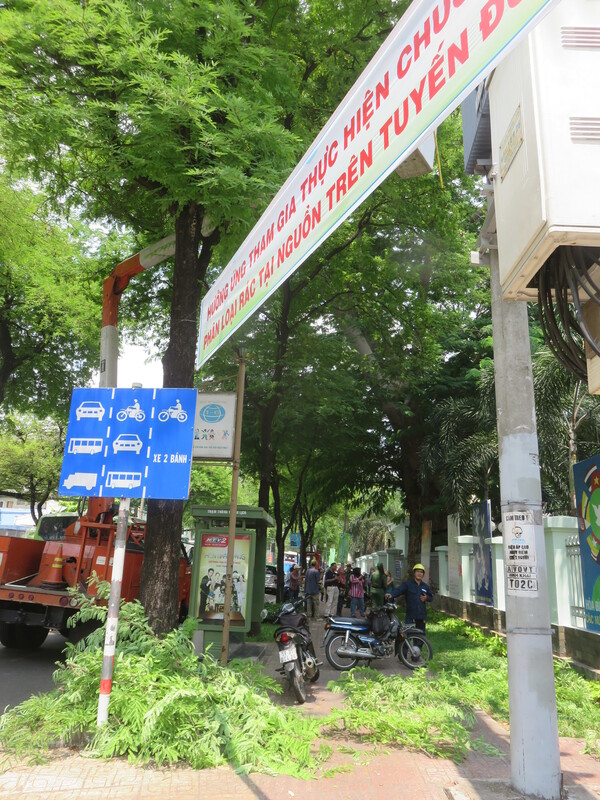 Categories: Vietnam | Tags: Food, HCMC, Vietnam, Yoga | Permalink.